Alden Richards Wins Recording Artist Of The Year Award, Paired With Janine Gutierrez In His New Show. Janine Now In Europe. Is She With Rayver Cruz? 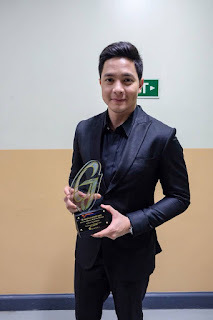 ALDEN RICHARDS is so happy to bag the Male Recording Artist of the Year Award at the recent Guillermo Mendoza Memorial Box Office Entertainment Awards. “Napakalaking karangalan nito kasi noong araw, never kong naisip na darating ang araw na magiging singer ako at recording artist,” he says. In the acting department, he has started taping for his new show on GMA-7, but everything is still under wraps since management wants to keep it secret. One thing is sure, though, even if Aldub fans are protesting, Janine Gutierrez is one of his leading ladies in the big-budgeted show. 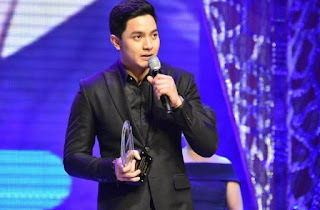 We’re glad for Alden since he is currently wasting his precious time and popularity by not having a teleserye or a movie for a long time now. Alden’s co-manager with GMA Artist Center now threatens to sue all those who are maligning him. Meanwhile, Janine Gutierrez has taken a short leave of absence to fulfill one of the wishes in her bucket list: traveling to Europe. She has long been planning to go there and finally, her wish is now is fulfilled with her intending to visit several European countries. Her fans are asking if she’s traveling with rumored boyfriend Rayver Cruz since when Janine went to Japan last March, Rayver was with her as she went around Tokyo Disneyland and they even had photos taken together with Mickey Mouse. Someone close to her told us that no, Rayver, is not with her as he’s currently busy taping regularly for a teleserye on ABS-CBN and cannot just leave now.